I've been thinking about it for a while and following Fanfest this year I've decided to try and run an Eve meet here in the Middle East region. I thought Dubai would be the best choice as its a global travel hub and probably has the most potential players within easy travel distance. Its basically going to be a social event. No presentations, no talks, no computers. Just a group of Eve Players having a drink, socializing and talking about important internet spaceships. I have no idea how many we'll get (three minimum I think but who really knows) and whether this will be the only one or whether there are enough players around here to make this a regular thing. Nelson's Pub which is located in the Media Rotana Hotel, Dubai. Note that its 21's and over in Dubai's bars so please nobody underage. Sorry. Eve-bet.com - 100,000,000 ISK Eve-Bet code for all those who turn up and a pirate cruiser for first 10! 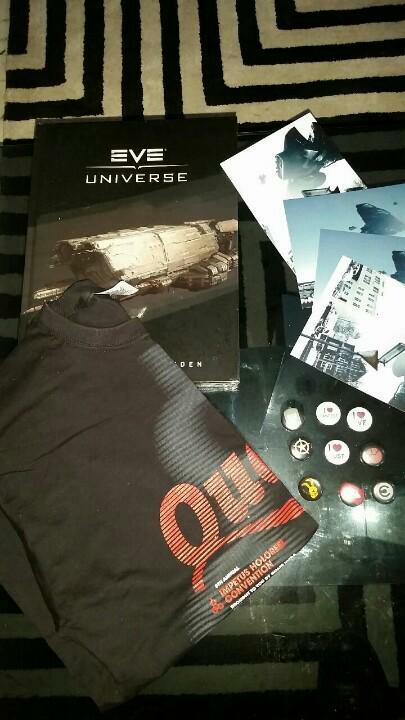 CCP - CCP Guard has sent a swag box containing a copy of The Art of Eve Online, T-Shirts, Buttons and Eve-O postcards! Drackarn - I'll chuck in two plex to be given away randomly around 9pm (drawn from a hat if we have a hat... I'm sure we'll find something!). A. If you live in the region you already know. Just in case you're looking at this as you are passing and might have opportunity to call in, well Fridays are the first full day of the weekend here. Thursday night will be too busy. Saturday night is no good as most us have work Sunday morning (I don't actually live near Dubai and I need to be at work Sunday morning!). An early start on a Friday evening will be the best bet to stake out a corner of Nelson's and give those travelling time to head back on Saturday! A. Stop right there. Here is a good post dispelling many of the misconceptions about things over here. When most people think of the region they think Saudi which has very different laws to other countries. Q. Do I need to RSVP? How do I get in contact? A. If you can let me know that will be great. Obviously I have no idea how popular a player meet will be here in the desert. We might get three, we might get half a dozen, we might get 20. If it looks like its a higher number I may need to speak to the venue and book a table etc. The event is on Evemeet.net. You can leave a comment here. I'm on Twitter @drackarn. Email is drackarn at gmail dot com. Or you can send me an in-game email. Plenty of options.